Our DOUBLE DENSITY RGB LED Roll has 2x the LEDs on the same 5-meter strip! Each flexible strip has 300 Super Bright RGB LEDs (60 RGB LEDs per meter). Control the color, brightness, and pattern of the entire roll remotely with one of our Infrared RGB LED controllers (sold separately). Each roll is 5 meters long, or almost 16 1/2 feet. On the back is a self-adhesive strip for easy installation. Strips are 3/8" wide and only 1/8" thick! Our strips can be lit using batteries or House Current (see below for power supplies sold separately). Rolls can be cut about every 2" for shorter strips (each strip will need a 4-pin connector soldered onto it). Each roll is currently sold with one connector pre-soldered. Additional 4-pin connectors are sold separately. Now with options! Rolls come with either a weatherproof silicon coating for outer protection or without any coating for more durability during movement (the latter is recommended for costumes worn indoors). PLEASE NOTE: Rolls should be uncoiled before lit to allow heat to dissipate. Our RGB LED Roll will bring brilliant color and light to any space. 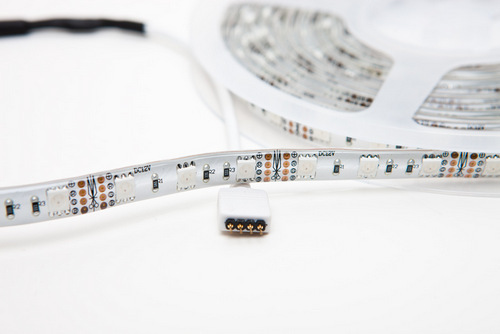 Each flexible Single Density strip has 150 Super Bright RGB LEDS (30 RGB LEDs per meter). The color, brightness, and pattern of the entire roll can be remotely controlled with one of our Infrared RGB LED controllers (sold separately). Rolls can be cut about every 4" for shorter strips (each strip will need a 4-pin connector soldered onto it). This Infrared Controller allows you to remotely control the color, brightness, and color-changing pattern of the entire RGB LED roll with a 24-button pad. Use with 12v battery power for portability or 110v House Current with our connector or power supply (sold separately). The 24-button pad functions include On/Off, +/- Brightness (8 toggle positions), 15 colors, White, and 4 Color-Changing patterns (Flash, Strobe White, Fade, and Smooth). See our Long Controller for the ability to program custom colors.